Low prices. OrangeSmile.com offers car hire service in Panama on the lowest-rate-guarantee basis, since we work with car suppliers directly. For your search criteria in Panama, we always select and show the best rental offers. The car reservation process consists of 3 simple steps: (1) search for available cars for your dates in Panama; (2) select your car type; and (3) fill in the booking forms. Once the reservation is completed, you will receive a confirmation voucher to your email address. During the booking process, please check your rental conditions. To pick up your car at the rental point in Panama, you need to provide our confirmation voucher, your driving license and a valid credit card. The final payment is normally carried out at the pick-up point. Our car hire points in Panama accept VISA, MasterCard, etc - please check your rental conditions. At the pick-up point, please read the handling manual and check the car for present defects. 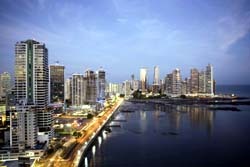 OrangeSmile.com wishes you a pleasant journey to Panama! The car hire reservation system OrangeSmile.com allows renting a vehicle in Panama within 10 minutes. Our largest database of car suppliers enables us to provide you a rental car in Panama at the cheapest rate ever possible. At rental locations in Panama we offer the following car sizes: mini, compact, economy, standard, premium and luxury. The following car types are available in Panama: Sedan, Hatchback, Jeep, Cabriolet, Coupe, Minivan and Minibus. Not many countries in the world cover the territory of fifteen hundred islands. Panama is a diverse country, where visitors can enjoy observation of historic sites and beautiful nature. The country is most known for the Panama Canal, the making of which opened a passage between the Pacific Ocean and the Caribbean Sea. However, there is much more to see in the beautiful country. Bocas del Toro is one of the most popular tourist destinations in the country. This is a chain of islands located in the northwest of Panama. It’s easy to reach the islands from the mainland on one of numerous boats. As Bocas del Toro is located not far away from the border with Costa Rica, many tourists from there come to visit this beautiful place for a few days. Beach rest, scuba diving and snorkeling, watersports and nightlife are the most popular entertaining activities. In Bocas del Toro one can observe rich underwater life and swim with dolphins and reef sharks, or rent a bike and explore the islands. Boquete is a mountain part of the country, which is approximately 1,000 metres above the sea level. This region is famous for one of the best coffee in the world and is very popular with fans of eco-tourism, who come to enjoy cooler weather and Volcan Baru. Panama is home to many national parks, many of which are added to the list of UNESCO World Heritage Sites. Coiba National Park is one of them. The park covers whole Coiba Island, the largest island in Central America. The Darien Gap National Park is primarily famous for a natural bridge that connects Central and South America. Impenetrable in some parts, the park is a great place to see pristine tropical nature, rare animals and birds. La Amistad International Park is also a beautiful place located on the border with Costa Rica, so it is managed by the both countries. The Panama Canal is a grandiose man-made 77km long canal built across the Isthmus of Panama. Its opening had crucial important for maritime trade. Travellers are recommended to visit the canal and see how ships are put into locks and then lifted 26m above the sea level to enter mad-made Gatun Lake. The Capital of the country, Panama City, is a modern metropolis with some interesting historic sites, such as the Casco Viejo area added to the UNESCO World Heritage List. The area is a great place to see colonial buildings and learn more about the pirate past of the country. Before going to the rental office, make sure you’ve prepared all the required documents specified in your voucher and, if necessary, a printed map of Panama. Collect them in one package in order to act quickly on the pick-up spot. If you a parking a cabrio/convertible in Panama, unfold the roof and close windows even if you plan to leave the car just for a moment.